Nahid Sepehri was born in Tehran, Iran. One year before she was born, her father, who was from a fanatic Muslim family, gave his heart to Christ. Nahid was raised in a semi-Christian family yet Muslim-dominated society. Despite many limitations and the post-Islamic Revolution (1979) Nahid was able to obtain a degree in Theology. Against all odds, she joined to serve with the Iranian Bible Society’s translation department. She continued this ministry until the government confiscated and closed the Bible Society in 1990. Some twenty years ago, as refugees, along with her husband and daughter, Nahid migrated to the United States. There she was able to join Today’s Persian Version translation team. Three-years later she was invited to become the Coordinator of that project. TPV was inaugurated in 2007 and became the turning point for her ministries. She has translated and published the most complete version of the Farsi Children’s Bible. In the March 2015, with the establishment of IBSD, Nahid was selected to serve as the Executive Director of this newly established Bible Society in exile. These days Nahid celebrates delivering hundreds of thousands of Farsi Bibles and New Testaments in to the hands Iranians worldwide. 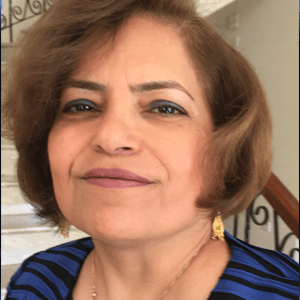 Nahid’s hope and dream is that while she is actively engaged in the global ministry of IBSD, she might one day see this ministry open its doors in Iran once again.